Looks like things have played out according to plan, and the prognosis remains the same. 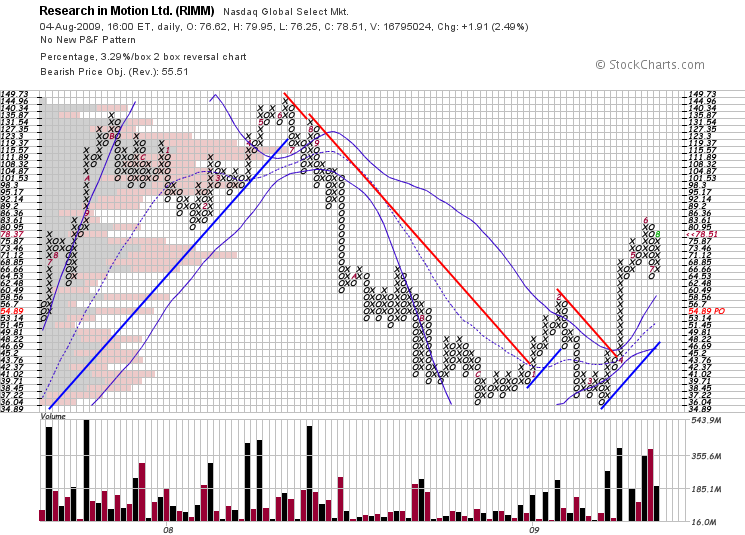 So long as RIMM can stay in an uptrend above a rising upper Bollinger, this is a good stock to hold. My only cause for concern is the recent secondary downtrend from June to July, which technically made a lower low. A breach of 62.28 would jeopardize the bullish thesis, but I’m counting on a break of 86.36, despite the downside price target of 54.89. Fundamentals, macroeconomics and valuations be damned, broad market strength continues to carry everything up, so don’t fight the rising tide.